Let us begin today's note by considering the plight of the Snake River's Coho and Sockeye. Of the Sockeye, the decade of 1990s saw the measly return of less than two-dozen adults to their spawning grounds. For the Coho their fate was complete disappearance, officially recognized as extinct by the federal government in 1986. If not for the Shoshone-Bannock Nation's forcing the ESA hand of the federal government, the Snake River Sockeye would surely have followed the Coho into oblivion. (3) The terms "conserve," "conserving," and "conservation" mean to use and the use of all methods and procedures which are necessary to bring any endangered species or threatened species to the point at which the measures provided pursuant to this Act are no longer necessary. In his inaugural address of February 20, 2014, Mr. Elliot Mainzer expressed his "tremendous confidence" in the Fish and Wildlife team. The following day, I offered a reward to anyone who could reveal where the Independent Science Advisory Board's review of NOAA Fisheries life-cycle models was included in the 2014 Supplemental FCRPS Biological Opinion. The email went out to a large cc and bcc list but I have yet to receive any response whatsoever. It may be that a claim of bluefish's two thousand dollar reward is in the works but with each passing day that seems less and less likely. Mr. Mainzer continues, "I believe that the program we have put in place meets both the letter and the spirit of the Endangered Species Act..." I openly wonder now, what it is that we should take from that. Over the past two decades, the Nation and its people have unamusedly watched the letter of the law repeatedly being contested. 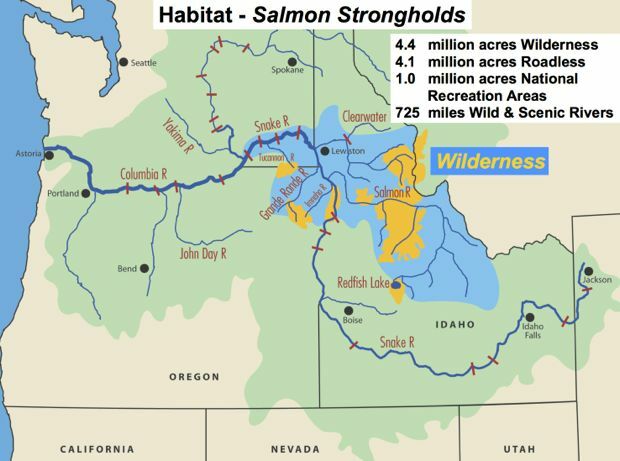 As a result, what was once hailed as Salmon-Recovery-dot-Gov and its "carrying out programs for the conservation of endangered species..." (ESA Section 7a Sentence 1) has become the lowered objective of insuring that agency actions are "not likely to jeopardize the continued existence of any endangered species..." (ESA Section 7a Sentence 2). The winners in this never-ending battle of words, meaning and spirit are up for anyone to debate but the Nation and its people have surely lost. The spirit of the Endangered Species Act has yet to arise from these ashes. (1) The Secretary shall review other programs administered by him and utilize such programs in furtherance of the purposes of this Act. All other Federal agencies shall, in consultation with and with the assistance of the Secretary, utilize their authorities in furtherance of the purposes of this Act by carrying out programs for the conservation of endangered species and threatened species listed pursuant to section 4 of this Act (emphasis mine). (2) Each Federal agency shall, in consultation with and with the assistance of the Secretary, insure that any action authorized, funded, or carried out by such agency (hereinafter in this section referred to as an "agency action") is not likely to jeopardize the continued existence of any endangered species or threatened species or result in the destruction or adverse modification of habitat of such species which is determined by the Secretary, after consultation as appropriate with affected States, to be critical, unless such agency has been granted an exemption for such action by the Committee pursuant to subsection (h) of this section. In fulfilling the requirements of this paragraph each agency shall use the best scientific and commercial data available. Dare I ask your opinion of how long this travesty shall go on? Your social media profile begins, "Member of the federal litigation team for past, present and (no doubt) future litigation relating to the operation of the Federal Columbia River Power System." It would appear to most that continuing to put off the ESA-defined conservation (see Definition above) is a central part of your strategy. If that is your goal, then hats off to you as you have successfully continued to delay the game to the benefit of the status quo. While the Fish & Wildlife Service typically completes the authoring of a recovery plan within a few years of a species' listing, two decades later Idaho's listed salmonids have yet to see the same: No recovery plan has appeared for Idaho's Steelhead, Sockeye, Spring/Summer or Fall Chinook. Congratulations. Next we should ask, "What has happened to the use of the best available science along the way?" To those equipped with a science-trained mind, the Walters et al. report takes on an entirely different meaning than it has for you who clumsily reached for it as support at the beginning of this thread. Quite remarkably, you somehow managed to completely miss the high points and one wonders if you ever read the twelve-page report in entirety. Properly equipped one readily reassembles the important facts of the Walters et al. report's closing paragraphs. Conservation actions should focus on life-history stages that are most susceptible to density dependence. Our analyses suggest that winter mortality is important for these populations. Use of winter refugia can be density dependent; ... (winter habitats) are likely in (the) larger main stem habitat. ... Another approach to reduce winter mortality is to increase juvenile quality going into that period. Several authors have proposed augmenting nutrient levels to increase growth. To our knowledge, none have demonstrated a population-level benefit to date. Noting failure in one area, one learns of success in a strikingly similar effort. In the Pacific Northwest, it is estimated that returning spawners supply only 6-7% of the historic load of marine-derived nutrients resulting in nutrient-limited streams. In addition, studies of nutrient additions in the form of salmon carcasses have often resulted in increased salmon growth. The interpretation that you take from Walters et al. -- more habitat work is all that is needed to address density-dependence -- misses another central, clearly stated message. In our study, the populations with the greatest degree of density dependence (Lemhi River, East Fork, and Crooked Fork) also experience a higher degree of anthropogenic disturbance; therefore, habitat restoration may be effective in some situations. However, many of the populations studied are in relatively undisturbed areas suggesting that habitat quality is not a universal limiting factor. 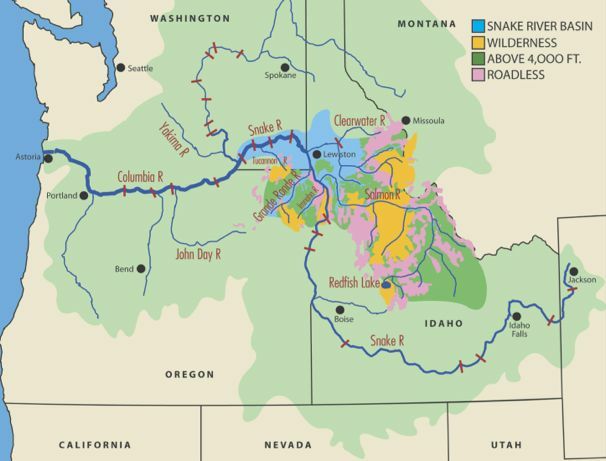 Given the power, you would assuredly have us all bury our heads to the geographic fact that the Snake River Basin contains the largest contiguous wilderness and roadless land complex in the coterminous United States. This 14 million-acre area includes more than 4.4 million acres in six Wilderness Areas, more than 700 miles in twelve Wild and Scenic Rivers, and nearly 1 million acres within two National Recreation Areas. It gets even worse. Blinded you mistakenly offer Walters et al. as support, which rather than strengthening your position, instead adds further support to the "compelling evidence" from which this thread first began; "compelling evidence indicating that numbers of hatchery salmon spawning in rivers accentuates density dependence such that lower survival offsets the anticipated benefits of supplementation of spring chinook salmon." Two popular management techniques, population supplementation with hatchery fish and restoration of spawning habitat, will be ineffective if juvenile clustering is not addressed. Increased numbers of juveniles due to stocking can actually lead to increased severity of density-dependent growth and survival if juveniles do not disperse. Renovation of spawning habitat is also ineffective unless adults colonise restored areas, and there is sufficient rearing habitat available. While some streams would clearly benefit from local habitat restoration efforts, many of these populations inhabit minimally impacted areas in remote settings. If density dependence is a natural feature of these populations, then it will be hard to generate many more smolts from the currently occupied areas. Indeed, Petrosky et al. found that the productivity rate (smolts per spawner) of the aggregated Snake River spring/summer Chinook salmon populations did not change significantly between the 1962 and 1999 brood years, indicating that the quality of currently occupied habitats has not changed greatly in the last few decades. Hilborn posited that stressed populations lose the less productive subunits first; surviving subunits are more productive and respond quickly but might not fill former areas. Therefore, recovery to levels capable of sustainable harvest may depend on an increase in smolt-to-adult survival rates, so there are sufficient adults to recolonise non-core areas (emphasis mine). Reading this last sentence, the life scientist is not surprised. Here is yet another instance revealing once again the oft learned message that Nature Knows Best. Most striking is that this same message, the need for an increase in smolt-to-adult survival rates, reappears year after year from various sources yet it appears to go unnoticed by the federal government's action agencies. Once again, you here have missed this important point that stresses what is needed for conservation; "the use of all methods and procedures which are necessary to bring any endangered species or threatened species to the point at which the measures provided pursuant to this (Endangered Species) Act are no longer necessary (ESA Section 3, Definitions)." In fulfilling the requirements of this paragraph each agency shall use the best scientific and commercial data available. I would argue still further, asking if your role and your actions -- misshaping science, ignoring compelling evidence, etc. -- authorized, funded and carried out by Action Agencies are in themselves a violation of the Endangered Species Act. You sir, have been funded to act in obstructing the best science available from being duly considered and in your success you have broken the law of the land. Perhaps you see things differently. I will patiently await your next response. In the meantime I suspect that Mr. Mainzer will be reassessing his prior beliefs. I am delighted that we have finally arrived at the point of discussion that I have tenaciously been bringing to the forefront. Your I-suppose-it-is-so response strongly suggests that the Independent Science Advisory Boards' February 2013 review of NOAA Fisheries' life-cycle models was completely ignored when authoring the 2014 Supplemental FCRPS Biological Opinion. To cement this point, bluefish.org is offering a two thousand dollar reward to anyone who can reveal to our website visitors as to how the "compelling evidence indicating that numbers of hatchery salmon spawning in rivers accentuates density dependence such that lower survival offsets the anticipated benefits of supplementation of spring chinook salmon," reported by the Independent Science Advisory Board, was anywhere included in the 2014 Supplemental FCRPS Biological Opinion. Two thousand dollars could be yours but only the first and/or best claim will be rewarded. host of www.bluefish.org , in the hope that well-informed decision-makers will be best able to make well informed decisions. You are missing the point. The study I sent simply concludes that density dependence is "ubiquitous" among SR S/S chinook salmon populations and that it appears to be occurring during juvenile production . It doesn't opine on the mechanism. I suppose that large numbers of hatchery juveniles competing with natural-origin fish rearing in the tributaries could certainly be a causative factor for some -- but not all -- populations in this ESU. Your terse email of last Monday attached "The Density Dilemma: Limitations on Juvenile Production in Threatened Salmon Populations" as your effort to refute the Independent Science Advisory Board finding of "compelling evidence indicating that numbers of hatchery salmon spawning in rivers accentuates density dependence such that lower survival offsets the anticipated benefits of supplementation for spring chinook salmon" (ISAB Chapter 4 Hatchery Effects, 6/28/13). Unfortunate for your argument, "The Density Dilemma" report contains nothing of support. To the contrary, this report lends still further support to the ISAB's "Review of NOAA Fisheries' Life-Cycle Models of Salmonid Populations in the Interior Columbia River Basin," (quoted above). In haste, you may have mistakenly sent along the wrong report in seeking to support your line of reasoning. Please try again. You may need to seek NOAA Fisheries' assistance. Note that the inability to provide would suggest that the best available science was not considered when authoring the 2014 Supplemental FCRPS Biological Opinion. This would be a travesty. The idea that there are insufficient resources due to nutrient limitation also has proponents (Achord et al. 2003). In Atlantic salmon Salmo salar, variation in prey biomass has been shown to be one of the most important factors driving growth (Ward et al. 2009). In the Pacific Northwest, it is estimated that returning spawners supply only 6-7% of the historic load of marine-derived nutrients (Gresh et al. 2000) resulting in nutrient-limited streams (Sanderson et al. 2009). In addition, studies of nutrient additions in the form of salmon carcasses have often resulted in increased salmon growth (Wipfli et al. 2003; Rinella et al. 2009). Lowered resource availability could also be interacting with abiotic factors; Crozier et al. (2010) found that density-dependent growth was more prevalent at higher temperatures, which they attributed to increased resource requirements at higher temperatures. The importance of spatial clustering, either due to clustered redd distribution and limited movement or due to predation risk, is less well explored. Two popular management techniques, population supplementation with hatchery fish and restoration of spawning habitat, will be ineffective if juvenile clustering is not addressed. Increased numbers of juveniles due to stocking can actually lead to increased severity of density-dependent growth and survival if juveniles do not disperse (Walters & Juanes 1993; Buhle et al. 2009). Renovation of spawning habitat is also ineffective unless adults colonise restored areas, and there is sufficient rearing habitat available. Conservation actions should focus on life-history stages that are most susceptible to density dependence. Our analyses suggest that winter mortality is important for these populations. Use of winter refugia can be density dependent (Armstrong & Griffiths 2001); however, winter habitats have not been identified for parr. If these are delineated, managers could consider how to increase refugia quantity. Given these areas are likely in larger main stem habitat, this problem needs careful and creative planning to make the issue tractable. Bjornn (1971) found that fewer fish emigrated in the fall from experimental channels provided with rubble substrate rather than gravel, showing the importance of appropriate habitat to fish preparing for winter. Another approach to reduce winter mortality is to increase juvenile quality going into that period. Several authors (Gresh et al. 2000; Wipfli et al. 2003; Kohler et al. 2012) have proposed augmenting nutrient levels to increase growth. To our knowledge, none have demonstrated a population-level benefit to date. Nutrient augmentation would likely be most successful if complemented by an increase in refugia in summer rearing reaches, which may allow juveniles to safely access resources currently too risky to use (Walters & Juanes 1993). The scale of the actions necessary to address density dependence across the study area is likely to be considerable and varies between streams. While some streams would clearly benefit from local habitat restoration efforts, many of these populations inhabit minimally impacted areas in remote settings. If density dependence is a natural feature of these populations, then it will be hard to generate many more smolts from the currently occupied areas. Indeed, Petrosky et al. (2001) found that the productivity rate (smolts per spawner) of the aggregated Snake River spring/summer Chinook salmon populations did not change significantly between the 1962 and 1999 brood years, indicating that the quality of currently occupied habitats has not changed greatly in the last few decades. Hilborn (1985) posited that stressed populations lose the less productive subunits first; surviving subunits are more productive and respond quickly but might not fill former areas. Therefore, recovery to levels capable of sustainable harvest may depend on an increase in smolt-to-adult survival rates, so there are sufficient adults to recolonise non-core areas. Here's one study among many. The authors write: "In this study, we demonstrate that density dependence is ubiquitous for spring/summer Chinook salmon that spawn in central Idaho USA." The study finds "strong support for density dependence in juvenile production," i.e. in the tributaries as I noted in my earlier correspondence. First off let me say that I truly appreciate you taking the time this busy week to respond to my inquiry regarding density dependence of salmon populations and the resultant decrease in productivity correlating with increases in abundance. I find this to be a fascinating topic that is well worth our further investigation. Appendix C of the 2014 Supplemental BiOp (Cooney and Zabel 2013) notes that recent increases in abundance and declines in R/S are "consistent with expectations that recruits-per-spawner will decline as abundance increases due to density dependent processes (Ricker 1954, Zabel et al. 2006)." Cooney and Zabel then statistically test the density dependence hypothesis for listed salmonid populations in the Interior Columba River basin (or those for which necessary data are available) and conclude that 20 out of 26 Chinook salmon populations and 18 out of 18 steelhead populations demonstrated statistically significant density dependent relations (Appendix C, 2014 Supplemental BiOp). In short, their findings support the hypothesis that density dependent processes are at work for most listed populations in the Interior Columbia River basin. Up to this point I fully agree. Cooney and Zabel have, in my opinion, done a fine job at revealing that "density dependent processes are at work." In all of this, we should keep in mind though, that salmon cover a large geographic range and that "density dependent processes" need not be primarily found where redds are built, eggs are laid, alevin develop, and fry emerge. Indeed when we consider that "20 out of 26 Chinook salmon populations and 18 out of 18 steelhead populations demonstrated a statistically significant density dependent relation", a reasonable scientist would reasonably hypothesize that such "density dependent processes" may very well be occurring where these populations aggregate. Moreover, a reasonable scientist would further suspect that such "density dependent processes" are unlikely to be occurring independently across a vast geographic region. This (Cooney & Zabel) finding lends strong support to the BiOp's emphasis on tributary and estuary habitat restoration, since it is highly likely that limits in habitat capacity are the cause of the density dependent declines in recent R/S productivity. After all, these habitats historically supported significantly larger populations. Therefore it follows that decreases in the quantity and/or quality of these habitats is a significant factor not only in recent productivity declines, but the declines in abundance relative to historic abundance levels. To support this line of reasoning in regards to tributary habitat, another science report needs to be referenced. For instance, it would not be surprising to learn that a comparison was made using the same Cooney & Zabel methodology with Smolt-to-Adult ratio taking the place of Recruit-to-Spawner ratio. If similar results occur in both, then this would point to habitats outside of the Recruit-to-Smolt life stage. It is remarkable and surprising that further supporting evidence does not appear. The point is that some further science is needed; otherwise your argument is non sequitur. Perhaps you can provide a reference document. One comment on the draft Supplemental Opinion expressed skepticism that density dependence actually is occurring in any listed populations because of small population sizes. The analysis in Appendix C speaks for itself in refuting this comment (emphasis mine). Having a solid foundation in science, I fully understand the argument of Appendix C, and in it I see no argument whatsoever that supports the specific contention that it is "limits in habitat capacity (that) are the cause of the density dependent declines in recent R/S productivity." An equally valid argument (or given the Independent Science Advisory Board model mentioned in first email, a better argument) could readily follow Appendix C to state that there is "compelling evidence indicating that numbers of hatchery salmon spawning in rivers accentuates density dependence. ..."
Rather than "speaking for itself" we learn here from the ISAB that in actuality, further science does exist that supports evidence of density dependence. Unfortunately for policy makers like yourself, this evidence runs counter to your contention that it is "highly likely" that it is the Recruit-to-Smolt habitat that is the limiting factor. Even more interesting to note is that NOAA Fisheries was somehow unable to notice this glaring omission when considering the legitimacy of the 2014 Supplemental FCRPS Biological Opinion. Perhaps Bruce Suzomoto or someone else from the approving agency would care to respond. Their silence would otherwise be deafening. Furthermore, if Appendix C truly "speaks for itself" then that would suggest that there is no further supporting evidence to your contention that "limits in habitat capacity are the cause of the density dependent declines in R/S productivity." If you are unable to provide any science to support this statement then it would readily appear to many that NOAA has made a policy-based decision, political perhaps, rather than one based on the best available science. In the hopes that the 2014 Supplemental FCRPS BiOp cannot be so easily found to be "arbitrary and capricious", supporting evidence should be readily forthcoming. To be clear I will reiterate. Appendix C contains absolutely nothing to refute the ISAB finding of "compelling evidence" that hatchery supplementation may be the most substantial contributor to the density dependence recently observed. Being open-minded, as a scientist should always strive to be, I challenge you to find error in my argument here and I will consider your response very diligently and respectfully. Promoting an open and honest dialogue concerning the plight of Idaho's wild Salmon and Steelhead. Scott, et al. - Kristin asked me to respond to this comment. So here goes. In fact, NOAA placed a great deal of emphasis on adult-to-adult return rates in the 2008 FCRPS BiOp. In the BiOp this metric is described as "returns-per-spawner," or "recruits-per-spawner" (abbreviated as R/S). In Chapter 7 of the 2008 Supplemental Comprehensive Analysis, which accompanied the BiOp, NOAA states, "Of the three metrics relevant to the recovery prong of the jeopardy standard, average R/S provides the most realistic assessment of the likelihood that a population will trend toward recovery..." (SCA 7-23). This finding lends strong support to the BiOp's emphasis on tributary and estuary habitat restoration, since it is highly likely that limits in habitat capacity are the cause of the density dependent declines in recent R/S productivity. After all, these habitats historically supported significantly larger populations. Therefore it follows that decreases in the quantity and/or quality of these habitats is a significant factor not only in recent productivity declines, but the declines in abundance relative to historic abundance levels. Thanks for your comment. I hope this response hit the mark for you. Kristen - John Barco suggested I forward this comment to you. If you feel like you could give a response to Mr. Levy, feel free to do so. Over the weekend, I noticed that the 2013 FCRPS Supplemental Biological Opinion highlights the recent evidence of "density dependence" on most all of the regions salmon populations (Figures 9-11 Appendix C, 2014 Supplemental BiOp). Being that this is occurring to most all populations reported upon, a scientist would look toward geographic areas where all of these populations combine. That would be a reasonable hypothesis for a reasonable scientist. By chance, I am posting today a story from November 2013 Columbia Basin Bulletin (see www.bluefish.org/sar_eval.htm excerpted below) in which the Independent Science Advisory Board observes the accentuation of "density dependence" from our efforts to increase "Abundance". Of course none of this is surprising to me as I discussed as much with NMFS' Acting Regional Administrator Donna Darm at the end of last century. During that meeting I emphasized that Adult-to-Adult return rate (or the similar but less transparent Smolt-to-Adult rate) would be an appropriate metric to gauge efforts toward species recovery. Focusing on Abundance before the all-important Return Ratio is a fundamentally flawed approach. (If anyone wishes me to elaborate further on this point I would be happy to continue). A key goal of such life-cycle models is to inform decision makers about the influence of restoration activities on the recovery and viability of ESA-listed salmon in the Columbia Basin. The NOAA Fisheries models look at potential impacts of habitat restoration actions, hatchery "supplementation," estuary and ocean conditions, climate change, the hydro system, population spatial structure and other factors. "Chapter 4 describes a novel modeling approach for investigating the likely effects of hatchery supplementation on wild salmon population dynamics," the ISAB report says. "This well-developed investigation used several decades of data for 23 Snake River spring chinook populations. "The ISAB commends the extensive use of existing data here and in many of the other models. This investigation provides compelling evidence indicating that numbers of hatchery salmon spawning in rivers accentuates density dependence such that lower survival offsets the anticipated benefits of supplementation for spring chinook salmon. "This modeling approach should be utilized for other species and watersheds when sufficient data exist, and the findings should be incorporated into other life-cycle models." I am passing this on to all of you as it appears that many of the salmon planners are unfortunately unaware of this extensive modeling that has occurred. Before salmon planners redouble habitat efforts, I feel that they should first consider this best available science. Hosting www.bluefish.org, in the hopes that well-informed decision-makers will make the most well-informed decisions.